In all of the back and forth “hot takes” fan theories and plot hole discussions, there’s been no discussion of how Star Wars: The Force Awakens has, as subtext, a discussion of the difficulty of constructing a non-Lucas Star Wars movie. Just as Harold Bloom theorized that modern poets had a hard time finding an original voice with so many precursors occupying their headspace, so, too, have J.J. Abrams and the other creators involved in the new Star Wars movie found themselves confronted with the difficulty of staking out some new territory in a galaxy far far away. When George Lucas made the original trilogy and the prequels, he was paying tribute to a bunch of films and genres that he loved as a child: Westerns, war movies, adventure serials, samurai movies, and old school science fiction and fantasy. After all, A New Hope is a hot-rod loving teen who is saved from wild Indians by a wizard so he can go into outer space with a pirate and his sidekick to fight a robot samurai lord. Lucas, while protective of his universe from the hands of others, can’t be said to be precious as to how he handled it. And for all of Lucas’s mis-steps, he never wavered in his faith that he knew his universe best. I don’t like the prequels very much, but they are not movies begging for the audience’s approval. But the task for J.J. Abrams and his team was much more daunting. How do creators who worship at the altar of Spielberg and Lucas handle making a film in the universe of one of their heroes? It couldn’t be a tribute like Super 8 or a reboot like the Star Trek films. The answer was to construct a film that intentionally lives in the shadow of the original trilogy in the same way modern commercial film lives in the trilogy’s shadow. After all, the movie starts with a would-be Ben Kenobi offering up the coordinates to Luke Skywalker in the reverent tones of a religious adherent or fanboy. We never get to learn anything else about Max von Sydow’s character before he’s dead and we’re off on the chase. Soon we’re deep into Jakku’s deserts, where Rey lives among the shadows of downed Imperial Star Destroyers and AT-ATs, scavenging for a living by polishing up the bits and pieces from the debris. When we see her relaxing, it’s by putting on an old discarded X-wing pilot’s helmet, with a X-wing pilot doll sitting nearby. Unlike Luke, who tinkers with his speeder, goes hunting, and longs to go to flight school, Rey’s non-working hours are occupied with nostalgia for a long-gone era. And once she gets drawn into the Resistance’s battle with the First Order, her reaction to meeting Han and Chewie and realizing she is on the Millennium Falcon is the in-universe equivalent of geeking out. But this feeling has a dark side as well (pun intended). Kylo Ren and the First Order’s own obsession with the events of three decades ago comes from that same place of inexperienced nostalgia. Kylo Ren, with his Darth Vader souvenir/paper-weight, is like the high school punk who wears a Misfits t-shirt and Minor Threat patches purchased from Hot Topic while opining on who is or is not a real punk. Not only are these people fascists, they’re insufferable. Their self-righteousness is part of what makes them so threatening. The Empire wanted to continue ruling the galaxy. The First Order is more interested in settling the score against the Republic that aided “the treachery of the Resistance,” as well as the Resistance itself. The impression we get from the First Order in this film is that they have no plan other than revenge. One of the few effective elements of the prequels was in delineating the galaxy of that time from the galaxy of the original trilogy, indicating societies that are in the process of growing or declining. The starships in the prequels are clean and well-kept; the cities are ornate and dazzling. In comparison, in the original trilogy, the Empire’s ships and bases are well-kept but coldly inhuman, while the Rebels hide out in ruins or wastes and fly dinged, dirty ships. 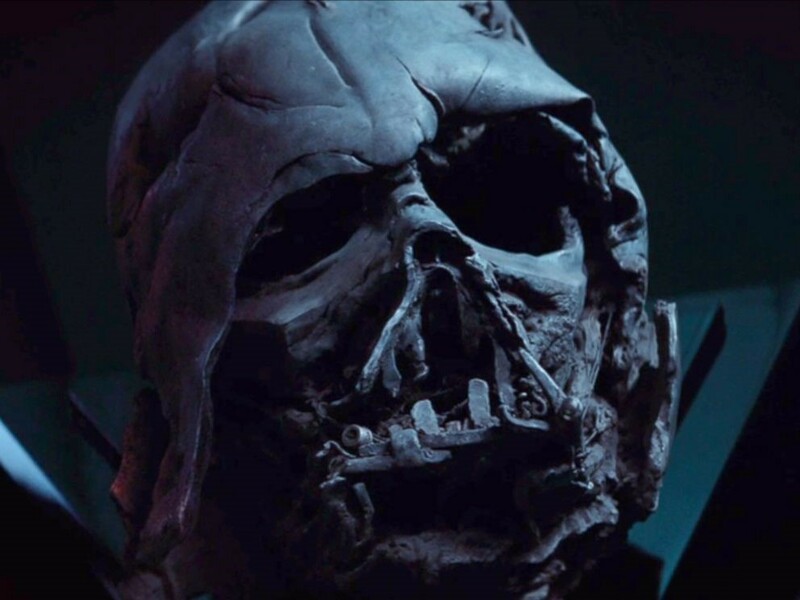 And the galaxy of the The Force Awakens shows that same status quo from the original trilogy. Both the First Order and the Resistance still have the same starships, the same weapons, even the same uniforms. We don’t see anything of the Republic homeworld before it’s blown away, but the impression we get of everyone is that the events of the past are what matter, even for the young ones in their shadow. Perhaps that is why Finn’s arc is so compelling, as he has little interest in getting dragged into this conflict. He has spent his entire life being trained to be a Stormtrooper and is tired of that way of life. 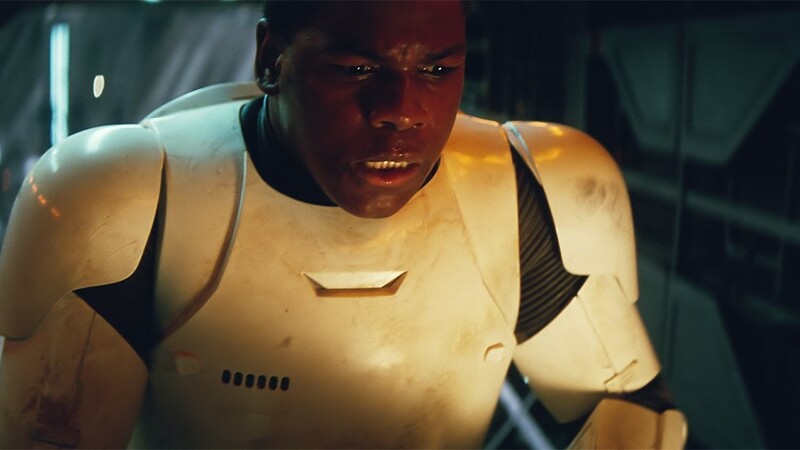 He’s tired of killing and tired of being a cog in a machine as FN-2187. Finn is not a coward (as is made clear by his willingness to take risks and fight to escape). He just wants something more out of life than another civil war. And that makes his volunteering for the mission to Starkiller Base more effective. He’s not swept along by an ideology. He makes a conscious choice. 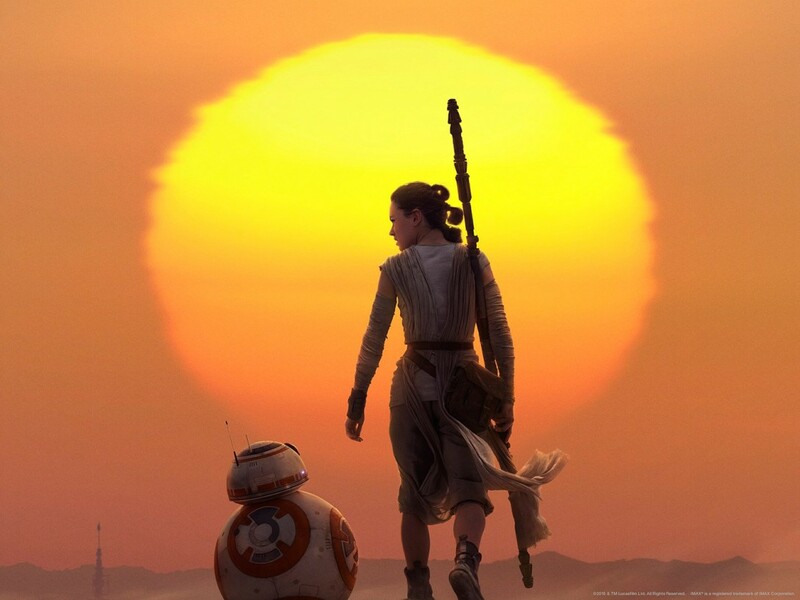 And his risking his life is part of the reason that Rey herself is able to put aside her desire to return to Jakku. J.J. Abrams will not be returning to direct the next movie, and perhaps it is just as well. What more does he have to say? Whatever my tone might indicate, I enjoyed the new movie. I teared up at the triumphal reprises in John Williams’ score and Han saying, “Chewie, we’re home.” But the new trilogy can’t just keep remixing the old movies in new combinations. That way lies boredom. The most compelling parts of The Force Awakens are the ones that show new characters making their own decisions. And by exploring what it’s like to struggle to get by in a world where it feels like all the important decisions were made decades ago by the older generations, a world where the new generation just lives with the consequences, the new trilogy will feel relevant. Robby Karol is a film and comic book nerd. He is currently hiding out in the Pacific Northwest with his wife, son and two weird dogs. ← Previous Previous post: Deadshirt is Reading: Captain Marvel and Starbrand and Nightmask!